I wanted not to achieve the professional painters above but do some degrade in color from the dark purple i primed (Army painter alien purple with zenithal highlight) to a light blue. What i have done was like i said above, primed in Alien purple and then with a very thin ultramarine blue i painted above the purple, the entire mini. The hood i did the same but then i used a lighter shade of blue with some white. My idea is to have a supernatural figure that is more bright near the lanterns \ above and more black below. How can i make the paw\mouth more gore? What would you do more to the lion ? I primed in white and then used AP skeleton bone on the entire body, followed by a dark brown wash (mane and body) following some AP desert yellow in the body. I then highlighted with some red and black the face\mouth. It’ll be a tough ordeal but anyone can get something resembling those two examples with time and practice. Nope we all start somewhere. You dont need to seal it until your done. You can paint, play and work on it until you get it the way you like for a long time. 1) If you're trying to do zenithal painting, it's easier to assemble the mini first. You want your imaginary light source that determines your highlights/shadows to be, well, in a constant location. It's hard to do that in a proper manner for every piece if you can't visually see where each piece will go and how they will fit together. 2) I'd put some blood/dried blood on his upper teeth as well. He bites down on his victims, so his upper teeth shouldn't be Colgate-approved. Apart from that, he's fine. Maybe a darker wash on his body to make his muscles a bit more prominent, but that's personal taste. I'm going to add to the top jaw... the colgate smile was bc the blood wasn't to my taste. I will probably Quickshade Dark when i'm done with him. You should probably look for tutorials on two brush blending or wet blending. Don't yet have personal experience with it, though. For the gore on the lion, I would either wash with Secret Weapon "dried blood", or redo the blood with Citadel "blood for the blood god", depending on the desired effect. One more thought: you could also make the existing blood look more fresh using a gloss varnish. Airbrush would make blending effect a lot easier. This time of year you may be scape one up on sale. Do some research on models and brands and go from there. Wet blending can be achieved used 2 or more brush at the same time, paint one color than move on to next with no time in between and set up rotation. very thinned paints will achieve that seeming-less blend look.Save your self some money and pick up liquidtex brand glaze medium, model brands have the same stuff different names and cost triple the price. 1 bottle should last you life time. Thin the paint and take your take building up the colors. Pooling May happen, but with glaze medium it’s less likely to happen, if it does try to work that in. There’s a bunch of different ways to get the colors to blend, some say start 1/3 if way in to each color and build it up over that so by time it hits next phase it’s in true form and darker a bottom and lighter at top. it sounds tough but basically pick a line and go up from there. Just try to avoid the definitive lines, think like curve for the watcher so it doesn’t end up candy caned look. Irregular lines and belnds make it look more natural. Only made made lines are perfect and uniform. Plus irregular shape plays tricks on the eye and makes the model pop more. But every painter starts someplace, so the base advise to sit down and start painting. @OP - if you're painting parts before assembly, it's almost guaranteed fail for the OLS / zenithal painting. You need the full model for the shadows to fall properly, because the model can/will self-shade. Put the model together, and you'll have better luck where painting where the shadows naturally fall. Adding to the chorus here, but I always paint fully assembled. Things that are hard to reach with a brush are also hard to see generally - you're losing a lot more detail from painting all disjointed than you are from poor detail in an obscure hard-to-reach nook. I generally start in the tough to reach spots, and then paint outward, that way I can paint a coat over errors in the easier adjacent spots. Watch a few tutorials on Glazing/Layering/Shading (These terms are mixed and matched by some, so I throw them together), Washing, and Highlighting. You base coats look fine to me, but I consider the basecoat to be 90% of the work, for 10% of the detail. Nearly all the detail that makes professional work pop comes from the glaze/wash/highlight steps. That top effect is actually simple to achieve, once you're more practiced. One advantage of monochrome, besides being faster, is that you can continue to paint over it. The light and dark areas will furthermore help you with your highlights and shadows when you later paint it. In physics we say, "how well you know physics is how many physics problems you have done." Painting is the same. If you want well painted miniatures, you need to paint a lot of miniatures. You are just starting, so of course you have a long way to go. Don't worry about setting an expectation, just keep painting! Having painted for almost two years and only recently gotten fairly good from a technical perspective, I can say, with confidence, that it will only lead to frustration if you think you're going to achieve close to those kinds of results with no experience. No matter how you approach this hobby there is a steep learning curve. I've been modelling and painting minis on and off for about 20 years, and although I can do a pretty neat job with some cool stuff those Watcher pictures are what I would call 'expert' level. You may be disappointed if you try to go for these exact styles with only limited modelling experience..
1/ Fully assemble your miniatures before starting/continuing painting. I used to paint individual pieces of models before assembly thinking it would allow me to reach all those hard to reach nooks easier, but looking back on it I would now say its a classic rookie error! The problem with painting first is that when you come to glue it all together the paint will often get in the way of the glue, leading to less secure models. KDM minis are very detailed and intricate, with some very dodgy joins- get paint on them and there's a good chance they will fall apart on you! The other important note is that those nooks don't matter as much as you may think! After a base coat and base layer those nooks will often not be noticed that much anyway, meaning there's no need to detail all those places most people won't see. 2/ The 'Tidy' Paint Job. If you have limited painting experience rather then going for complex things like lighting effects go for good old neatness. A tidy paint job looks serviceable on the tabletop, and can achieve a nice look without hours of work or stress! 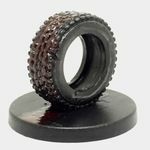 Base Coat- Either block paint or use a spray to coat the whole model in a single base colour. I usually use Black or White. You will be painting over all of this, but it sets a solid layer to paint upon and the tone of your model. 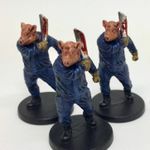 A White base coat will make colours and the eventual model look lighter (good for survivors and lighter coloured monsters such as the White Lion), whilst a Black base coat will make the overall effect darker (good for darker coloured monsters such as the Screaming Antelope and Butcher). A spray is better then standard paint as the coat will be thinner (retaining more detail on the model). Base Layer- This is the meat of your paint job. Paint all the solid colours onto your miniature. Paint Brown areas Brown, White areas White, etc. When done the model will look vaguely like you want it, bar shading and details like the eyes, etc. Wash Layer- This is probably the no.1 rookie weapon! A 'wash' is a watered down or ink version of a paint which is applied to all of an area of a model. The excess is then wiped away (using either a bit of tissue or a finger), leaving the wash only in recesses and corners of the model's detail. Using a darker colour wash in this way gives an immediate shading effect with very little effort, and can often make a model's colours really 'pop'. You mentioned Games Workshop paints in your OP. These guys do several washes/inks which are perfect for this. Highlight Layer- This stage is optional depending upon how far you want to go with your finish. Highlighting involves picking out certain raised areas with a lighter colour to give a little more depth to the shading. 'Dry brushing' is your best friend here. Take the desired colour and wipe most of it off your brush onto some tissue (until the brush appears dry). Then very gently draw the brush back and forth over the areas you want to highlight. A very gentle layer of the lighter colour will start to build up. Repeat over and over until you get the brightness required. This allows you to shade easily, as you can slowly dry brush more and more paint onto the area as you move along the model. Details- Your model should now be nearly finished. This final step involves doing the 'fiddly' bits. Touch up your work. Make sure any unwanted splodges or overlaps are painted over (sometimes the side of your brush will leave a splodge in an unwanted place, happens to us all). Paint the eyes, teeth and claws, add additional details (I like adding muck, rust and blood to weapons and armour where appropriate). I will add other odd details at this point too. I'm going to add little patches of static grass to the bases, I'm intending to add some dangling gore to my Screaming Antelopes horns, etc. These things are totally optional. For example, if you don't think you can paint the eyes on your survivors (a very fine detail) then don't, they'll look fine with what you have done so far! This is just my method and I'm sure there's better painters out there- I am not saying my method is the only one! But if any of this helps others learning to paint minis then that's great! Good luck! KDM is a big modelling project! This is almost exactly what I'm doing. Often I will actually do the washing as the last step. It makes the miniature darker, but also less clean and smooths transitions, which to me often makes it feel more "natural". We used to have to spend years prodding minis without any clue- but these days there are a lot of resources to help you improve. In person lessons from a master are always the best- but usually they're not available unless you attend any conventions (Reapercon is probably the best painters convention in the US, followed by Adepticon and Gencon). There are a lot of online resources- videos and printed materials, plus you can ask questions. 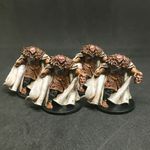 I recommend the Reaper forums for feedback- they're an encouraging spot, but they can also give you advise on improving (and they don't care if you're not painting Reaper figs).